There are many components that a store operator needs to do right to have a successful business. Good customer service is a must. Having the proper selection of products appropriately priced is very helpful. Freshly made food and a beverage bar can provide additional gross profit opportunities. I think we can all agree on these things. Unfortunately, there is one component that when not done well can doom everything else that is good: cleanliness. No matter how friendly your employees are, how tasty your food is or how cheap your products are, if your store is perceived as dirty by the customer, they will not visit you. Your sales and profits will suffer. Do a deep clean of the store and fuel equipment. It never ceases to amaze me how much dirt and grime can accumulate in a store over time. The frustrating thing is that the dirt and grime build up even though you are not doing anything. The way I think of it is that uncleanliness is a constant event and keeping things clean is a never-ending battle against filth. The first thing we do is mop and clean the floors. However, a mop with soap and water doesn’t usually do the job, so our team members can often be seen on their hands and knees scrubbing parts of the floor that mopping won’t clean. Once the floor has been initially clean, we then move the shelving gondolas six inches. It never fails that the previous owner attempted to clean the floors with a very wet mop, creating rust stains from the shelving units on the flooring. We scrub these off, if possible, and then move the gondolas six inches the opposite direction to clean the other side. If possible, we take off the shelving skirts or endcaps so that we can sweep or vacuum the floor inside the shelving unit. Talk about dust bunny central! We’ve found some very expired product and a few deceased mammals under the shelves in the past. Once the shelving has been put in its final position and the floor cleaned again, we assess whether it needs to be buffed or polished. We usually contract out the work to a local firm, which will then take care of the floor on a scheduled maintenance basis for us. A store’s floors are important in setting the initial impression the customer has of the store. 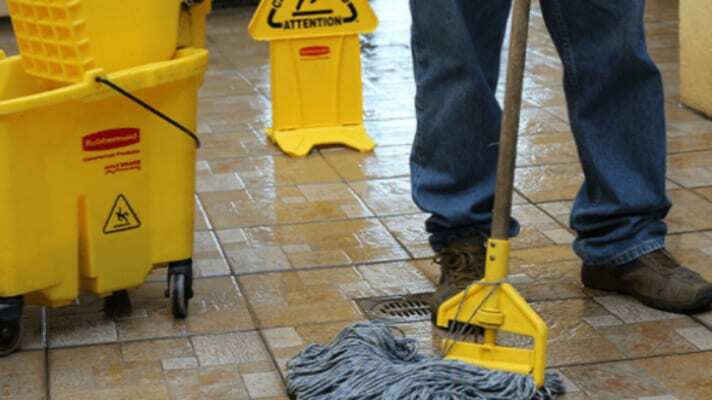 Clean floors are expected and, more importantly, are safer floors (as long as you keep them dry). The No. 2 thing that can kill a store’s foodservice business is a dirty bathroom (No. 1 is bad-tasting food). When a customer sees a filthy restroom, they immediately wonder how clean your foodservice preparation area is. A dirty bathroom equates to dirty employees and dirty food facilities in your customer’s mind. When we move into a store, the bathrooms have usually been neglected for quite a while. We’ve had some so filthy that we’ve had to bring in commercial cleaners to do the work. The basic rule of thumb is that every smooth surface (sinks, toilets, floors, tiles) needs to be scrubbed and sanitized. Every broken or chipped piece of equipment (basin, toilet, towel machine, hand dryer) needs to be replaced. And every painted surface (walls and door) needs to be repainted. Only with a complete overhaul will you get things to the level that your customer will accept as the minimum standard. If you have the time and creativity, add flowers, pictures, an air freshener and wallpaper for bonus points with your customer. We’ve talked about the impact a dirty bathroom can have on your foodservice program. Let’s assume this corollary is true. All of your foodservice equipment should be broken down, repaired, cleaned and sanitized. Not only is this good for extending the life of your equipment, but it can also help you avoid making people ill through contamination. Please don’t forget to clean the fountain machine heads. Unscrew the heads and soak them in hot, soapy water to get the syrup buildup (and other gunk) off them. You may be surprised how the taste of your fountain drinks changes after you clean the heads — if you haven’t done so in a while. We’ve already talked about the space under the shelves. Now, let’s focus on the shelving itself. The shelving provides you with the setting for the products that you are selling. The more attractive the setting, the more products you will sell. All products need to be removed and the shelves scrubbed and disinfected. Broken shelves or mismatched equipment should be replaced, if possible. Don’t forget to clean the backboards of all shelving units and wipe down the underside of the shelves to remove cobwebs. When putting the products back on the shelves, be sure to wipe down the cans and bottles and then clean the tops of all the products. No one wants to pick up a dusty can of beans. Even if the product arrived last week, when it is dusty or the label is torn, it gives off the impression of being old and stale. It won’t sell. Rarely does a week go by that some can, bottle or carton hasn’t leaked. All of this liquid tends to fall to the floor and collect. In some cases, it starts to smell. In other cases, it attracts insects and vermin. In all cases, it is unsightly and gives your store a bad image. Hot water and soap, along with some disinfectant, usually fixes the problem. Every piece of glass needs to be cleaned in the store — exterior windows, cooler doors, sneeze guards and bathroom mirrors. Before cleaning them with a solvent, be sure to remove any signs or posters that are attached. You should only have professionally printed signs on your windows and, even then, use them sparingly so that your store feels open and light. Here too, signs and stickers need to be removed (except for the ones required by law). We try to clean the card readers, pump faces and hoses. If there are any oil company decals on the equipment that have become tattered or torn, we try to have them replaced as soon as possible. Please pay extra attention to the nozzle handles and hoses. They need to be wiped down to reduce the oil and grease that accumulate. When possible, we try to scrape up leftover gum remains. We then have a commercial company power-wash the pavement and concrete. An assessment as to whether the parking lot needs to be restriped is made and arranged if necessary. While you have the power washer there, look at the sides of your building. Are they scuffed up or covered with graffiti? Washing them might help, or you can get graffiti removal solvent to try and get most of the tags off the wall. In dire circumstances, a coat of paint can go a long way. Check out the mansard and canopies. Do they need to be cleaned? Are there nests being built inside? Are pieces missing? Any of these things will detract from the image of your store as customers pull up to shop with you. Once the deep clean is done, I suggest the following cleaning routine: mop floors two times a day (more if it rains), dust shelves and product daily (use a Swiffer and not a feather duster), clean all glass weekly, clean food prep areas twice a day, clean fountain machines daily, pick up trash off the lot every shift, and empty the trash cans (inside the store and outside) every shift. The process of deep cleaning a store is not easy, nor is it fast. It usually takes us three or four weeks to get all of the work done (and we are having it done while we are open for business in most cases). But the time it takes is well worth the results. Your customers will notice the difference (or more importantly, not notice that it is not clean) and your employees with have more pride in their workplace, their job and their team.